Are you in the need of a regulated and fully qualified electrician to assist with all the safety checks that come with owning your own business? Do you live in Streatham and have an electrical emergency that requires a 24 hour callout service? If you answer yes to either of these questions, or in fact many other situations and circumstances where an electrician is needed then South London Electricians are the ones for you. Our first class services have been offered to residential and commercial customers for over 23 years now. We are based in Croydon but extend our services to the wider Home Counties and South London area. We operate on a 24/7 basis, there for you whenever you need us; always offering an expert with the right knowledge and skill to be able to come to the best solution for you. As quickly as possible. If you are in the need of any of the above, or in fact any of the great services that we offer then you will be pleased to know that we offer a no-obligation quote for everything that we can do. This makes sure that you are fully aware of any costs before we start on your project. 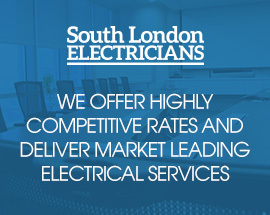 Every member of the South London Electricians team knows the importance of offering a reliable service that delivers each and every time. As well as this, as a company we understand that in modern society there are many businesses and homeowners who are facing tighter financial constraints. This is why we not only dedicate ourselves to a great service but also an affordable one too. During the time we have been operational South London Electricians have gained experience in both commercial and residential projects, varying in size from a simple fuse board installation at home to installing and checking the electrics in a restaurant. Whether you only need one of our electricians, or a whole taskforce you can be sure that each and every one is an expert in the field. How can we claim this? Simply because every member of the team has individually obtained the right qualifications to be able to carry out this work and are updated to ensure that they are aware of most recent legalisation and guidance relating to electrics. Your safety is always on our mind! If you are looking for a fantastic electrician then call 07956 523316 today and discover how good an electrician can be!